I make the worst cheese sauce on the planet. No, scrub that – I would make the worst cheese sauce on the planet if only I bothered! I rarely have flour or milk in the house, and I can’t get past the fact that soya, rice or almond milk just doesn’t seem to make very good sauces. The only time this culinary black spot bothers me is when I want macaroni cheese. My mother made the best macaroni cheese on the planet – a tasty, cheesy sauce with a dash of mustard in that was thick enough to coat the pasta properly and to stay on the fork, and crunchy breadcrumbs coating the top. It was her full-proof method of bribing me to do something: “I’ll make you macaroni cheese on Wednesday night if you give me a lift to a meeting afterwards.” Shazza Cabs was always there like a flash! There are some fairly decent supermarket ready meals available, but macaroni cheese isn’t one of them – the sauce is always tasteless and too thin. So I end up going without and periodically resolving to have a go at making cheese sauce. So you’ll excuse my excitement when I spotted ‘Mac ‘n’ cheese’ on the menu at the Wilson Café in Cheltenham. 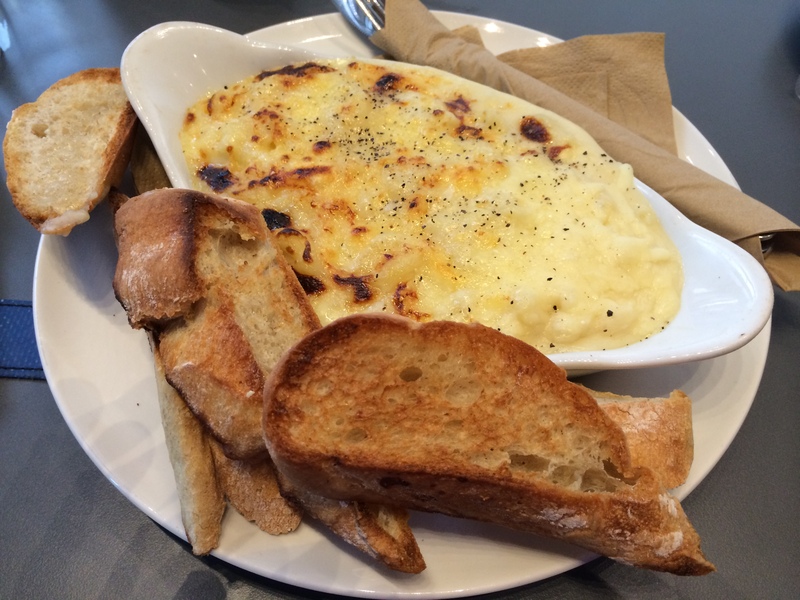 I’m even going to forgive them that glaring Americanism, as it was the best macaroni cheese ever. I dragged a friend there several days later so I could make sure the first time hadn’t been a fluke. It hadn’t. The sauce was perfect, the topping crispy and it came with a stack of bread lightly brushed with garlic. I think I took the glaze off the dish making sure I hadn’t missed a trace of sauce! The Wilson Café is a good little find – it’s part of the revamped museum and art gallery in town. The previous café was up lots of stairs and was full once four people were in there. The new one is on the ground floor at the front of the building and has a couple of tables outside. There’s not a huge menu, but what there is seems to be decent quality, and there are always a couple of veggie choices there (even if they’re heavy on eggs, particularly for the breakfast choices). Vegans will struggle, though. The coffee and cakes are yummy as well, and the staff seem friendly. A few people have moaned to me about the slow service there; it’s been fine on the four or five I’ve visited, although the place doesn’t look over-burdened with staff. I have a nasty feeling the café changes its menu periodically. So I could be OD’ing on macaroni cheese for a while! An Indian kitchen can be anywhere in the world. Mine just happens to be in London. I had decided that I wasn’t going to buy any more recipe books that included meat recipes. I was sick of having to skip over so many pages that I couldn’t use. I was going to stick to buying only vegetarian recipe books. And then I was listening to the Woman’s Hour Cook the Perfect podcast on the way to work one morning. I listened to Meera Sodha cook her Daily Dal recipe and talk about cooking Indian family food in Britain. Meera’s family (originally from Gujarat in India) had been expelled from Uganda in 1972 and had ended up Lincolnshire. Meera’s mother had continued to cook Gujarati food but with British ingredients. This cookbook is based around those recipes. It’s a lovely warm hug of a book. It’s full of fresh flavours and recipes that encourage rather than intimidate. There are some specialist ingredients, but most of these recipes only need a trip to the average supermarket, not an hour spent online tracking down obscure spices. There’s a Menu Ideas section with menus for 2, 4, 6 and 8 vegetarians. There’s an Alternative Contents section with ideas for 1st Timer Recipes, Midweek Meals, Get the Kids Involved, Gluten Free and other options. The recipes are clear, one to a page with plenty of full page colour photographs. While there are meat recipes there, they are restricted to two chapters and make up less than a quarter of the book. The tone of the book is chatty and cheerful, mixed in with a few family stories, like a good conversation between foodie friends. I have tried the Daily Dal and it is excellent. There is also a recipe for 100 Garlic-Clove Curry. I might have to give that one a try sometime soon! The recipe in the book calls for French beans, but with runner beans being in season I decided to use them. This is a lovely, gently spiced dish. It’s not hot, but warming from the ginger. 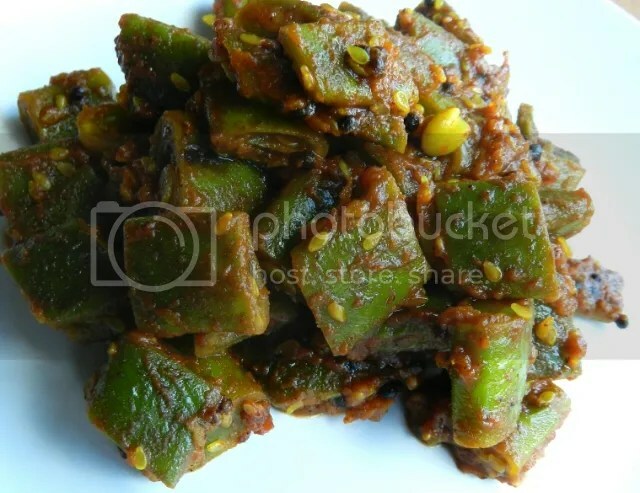 It can be served as a side dish safe in the knowledge that it won’t overpower whatever it’s served with. Add a little oil to a large frying pan on a medium heat. Add the mustard seeds and sesame seeds. When they start to pop add the beans and stir fry for a couple of minutes. Add the ginger and stir for another two minutes. Add the tomato puree, turmeric and a splash of water. Cover with a lid, turn the heat down and simmer for a couple of minutes. When the beans are tender, season with salt and pepper and serve. For a long time in the UK, if you wanted a book to show you how to cook Indian food, Madhur Jaffrey was the only choice. So it’s just as well that she knows what she’s talking about and can communicate successfully to a wide range of people. This year I have bought three Indian cookery books, all of a high quality. Curry Easy Vegetarian is the third one of the three and I’m reviewing it first, because it is the best. As a home cook, I tend to like books written by cooks rather than chefs. It may be the tone is friendlier, it may be the knowledge of what is achievable in a home kitchen, it may be because it’s written by someone who has to do their own washing up. I don’t what it is, but give me a book written by someone who doesn’t have a test kitchen. There are some unfamiliar recipes and techniques here, but Madhur Jaffrey has the tone of someone who is encouraging you to have a go, rather than someone setting a test. The recipes are well laid out, attractively photographed and carefully explained. When I was first going through it, I found so many recipes I wanted to try that I ran out of bookmarks. The vegetable section has one recipe more enticing than another. There are poriyals – stir-fries with indian flavours that I can’t wait to try and dals that make me glad cold weather is coming so I can curl up on a wet day with them. And there are unexpected flavours too – rice with dill and peas, fresh peach salad, cucumber salad. In terms of ingredients most of them should be familiar and available in most supermarkets (for which Madhur Jaffrey should take a good deal of the credit). She explains the more unfamiliar ones. My only warning is that several of the recipes require fresh curry leaves which may not be that easy to get hold of. I really like this book and I’ve been recommending it to friends. It has a recipe for turnip – what’s not to like? In the introduction Madhur talks about how a lot of the recipes are from homes throughout India and won’t have appeared on restaurant menus. 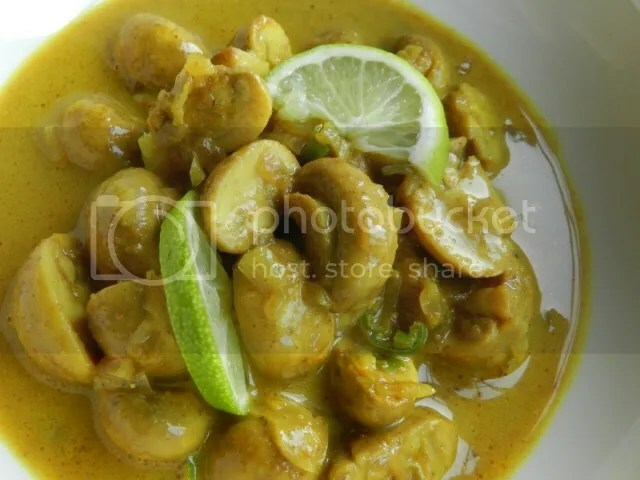 One of those she mentions is Kodava Mushroom Curry. I decided to give it a try. I stuck to the recipe, apart from using low-fat coconut milk, so I omitted the stage of letting it settle as it would have had no effect. I don’t know if that made a huge difference, this was hot, creamy and delicious anyway. Open the tin of coconut milk and spoon the thick cream at the top into a bowl. Leave the thinner milk in the tin. Put the mushrooms in another bowl, sprinkle over the salt and turmeric and stir until all the mushrooms are coated. Put the oil in a medium hot frying pan or wok. Add the shallots and fry until they are just starting to turn brown. Remove from the heat and stir in the coriander and chilli powder. Return to the heat and add the chillies, and then the mushrooms and their accumulated liquid. Stir and cook for about 2 minutes. Add the thin coconut milk and simmer, uncovered for about 10 minutes. Add the coconut cream and simmer on a very low heat for a minute. Gentle reader, I have a confession to make: I am not actually a vegetarian. But even a hardened omnivore can appreciate a vegetarian meal occasionally, and I think that those of us who eat meat should probably eat less of it, so I try to eat vegetarian meals as often as possible. This is a resolve that usually falls over when I’m out to eat, because there don’t tend to be a lot of vegetarian options on restaurant menus. So I was interested to discover The Garden Café, which is in the Garden Museum, right next to Lambeth Palace. It serves only vegetarian meals. Disappointed carnivores will have to turn around and go and find a Pret on the other side of the river. I and my parents are not disappointed carnivores, so we ordered lunch instead. The Garden Café serves a smaller weekend menu, with just three choices of main meal: when we turned up, these were a carrot soup with crème fraiche and chilli garnish, a butternut squash and feta tart, and red peppers stuffed with bulgur wheat, Gruyère and olives. The peppers and tarts were accompanied by a trio of salads, one plain green, one coleslaw, and one chickpeas, feta, and several different varieties of tomato with a lemony dressing. The soup came with fresh bread. I had the stuffed peppers; my parents both went for the tarts. The stuffed pepper was delicious, tender and vivid, and the stuffing was perfect, fluffy and full of flavour. The green salad was crisp and fresh and the chickpea salad excellent, sharp, peppery and lemony. I can’t stand coleslaw, so didn’t touch mine, but my parents reviewed it highly. Similarly, the butternut and feta tarts came in for high praise. The Garden Café offers more options in terms of dessert, probably because it mostly sells people coffee and cake. There’s a nice selection of the usual sweet things – brownies and frangipane featured when we were there – but also a couple of cakes with more interesting flavours. We chose a slice of courgette, lime and ginger cake. It was delicious: imagine a carrot cake, with all the moistness and lightness of a really well-made carrot cake, but with a less obtrusive vegetable flavour lending depth to the mild spice of lime and ginger. I nearly went in and asked for the recipe. That said, this is a pretty restaurant that serves tasty vegetarian food for reasonable prices in central London. It’s got a lot going for it, and we’ll definitely be going back. Maybe this time I’ll remember to ask for the courgette cake recipe. This is the second ‘vegetables first’ cookbook by Yotam Ottolenghi. For those of us who have his first book, Plenty, this is more of the same. It is a lushly photographed celebration of vegetables, fruits, funghi, grains and pulses. You cannot read this book without realising that this is a man who loves vegetables and knows how to put them together to make a multi-flavoured, multi-textured dish. Ottolenghi gets accused of using a lot of ingredients, most of them difficult to get hold of. The last one isn’t that true – you can get most of the ingredients in one of the big, main supermarkets. As for a lot of ingredients, well, you can’t get layers of flavour and texture without them. This is not a book to reach for when you want to throw something together after a long day at work, but if you have the time to spare this book will give you something special to eat at the end of the process. It does have its eccentricities, though. It is divided into sections by cooking method, so you get Tossed, Steamed, Blanched, Simmered, Braised, Grilled, Roasted, Fried, Mashed, Cracked, Baked and Sweetened as chapters. Now, it might just be me, but I don’t normally wander into the kitchen when I’m hungry and think ‘Hmm, I fancy something blanched today!’ There is an index, but no glossary of ingredients. Sometimes Ottolenghi explains the more unusual ingredients at the start of the recipe or in the ingredients list, but sometimes he doesn’t. Sometimes he suggests alternatives, but sometimes not. If you don’t know what za’atar, shiso and freekeh are, this book isn’t going to tell you. I think the Tossed chapter is the most successful. Yes, there are lots of ingredients, but they mostly just need putting in the salad bowl or mixing in the dressing. And there are really interesting dressings that would go well on several different dishes. My least favourite sections are the Cracked and Baked ones. Mr Ottolenghi says in the introduction that he is not a vegetarian and does not want to be pigeon-holed as a vegetarian writer (the horror!). It really shows in this section, not just because there’s a lot of cheese in these recipes, but because there appears to be no attempt to choose vegetarian cheeses. Parmesan is used a lot, gorgonzola appears, so does roquefort. There’s no help for it, you cannot use any named cheese in this book unless you first check that it’s vegetarian. I spotted 22 recipes using non-vegetarian cheese, there may be others. This is a bit of mixed bag of a book. It is in turns inspirational, aspirational and infuriating for this vegetarian home cook. Having said that, if more chefs took recipes from this book and put them on menus as the veggie option, I would be a much happier woman. 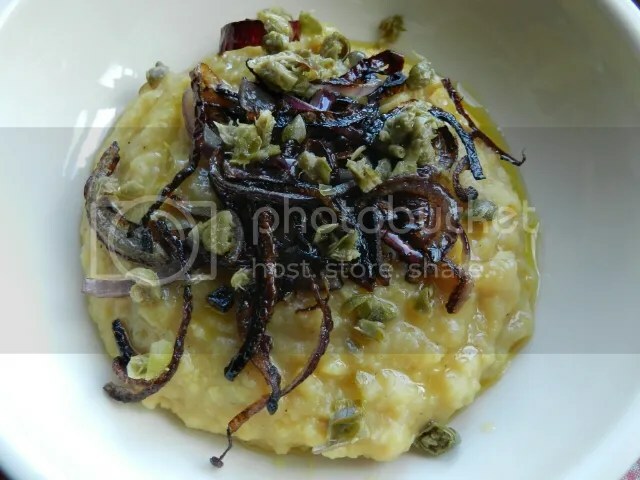 I was thinking of doing one of the Tossed salads for my recipe tryout, but then I found Ottolenghi had done a recipe for Fava, the greek version of pease pudding. That decided it for this Durham lass! Besides, as in a lot of the traditional recipes in the book, they haven’t been complicated. Chop one of the onions into rough chunks. Add to the split peas, bay leaves and turmeric in a large saucepan. Add enough water to cover twice the amount of peas. Bring to the simmer, skim off any scum, cover and let simmer for 60 minutes or until the peas are soft. Keep an eye on them and add more water if necessary, they should be loose and sloppy like thick porridge at the end. While the peas are cooking, slice the remaining onions finely and fry in a tablespoon of the oil until they are golden brown. Set aside. When the peas are cooked, remove the bay leaves, blend the peas with the olive oil, garlic cloves and lemon juice until you have a smooth paste. Add water if the mixture is too stiff. Stir in half the fried onion. Serve in a bowl with the rest of the fried onion, capers, chives and add a drizzle of olive oil.